Football will disappear. Maybe not tomorrow, but at some point, football will practically vanish from popular culture. Not like a snap of the fingers, but gradually it will recede from the horizon in a slow march away from its reign as America’s pastime. Too violent. Too many stories about ex-NFL players killing themselves to escape pain. Too many reports about the hazards and irreversibility of chronic traumatic encephalopathy. Parents won’t let their sons play and Americans will ultimately turn away from the sport. Many accept this dire outlook, particularly in the wake of a recent study that found CTE in 99 percent of the studied brains from deceased NFL players. Much of the football community chides detractors for softness. University of North Carolina football coach Larry Fedora, for instance, claimed the attack on football could bring America down. The NFL, nonetheless, clearly fears the future. This explains why its leadership, seemingly each summer, concocts a new set of rules that supposedly take away some risks associated with the game, such as the recent rule changes on how players can use their helmets. But an inherently violent sport that requires humans to collide with other humans at maximum speed will forever be unsafe. And the new rules the NFL implements are more effective at simply changing the game, as Bleacher Report’s Mike Freeman notes, than making it meaningfully less dangerous. Once society deems a sporting event to be too dangerous, or out of step with the culture, at best it becomes a fringe sport like boxing, or at worst, it could go the way of gladiator bouts. Extinct. This conundrum — the game is best when it includes its most dangerous elements, but when it includes its most dangerous elements, the game can’t survive — can only be solved by taking humans off the gridiron. The real future of football is as an esport. This idea hit me while watching the first season of the Overwatch League. A team-based, first-person shooter video game, Overwatch ushered esports to new heights in its inaugural season, with its Super Bowl equivalent being broadcast on ESPN before a jam-packed audience at the Barclays Center. The television ratings weren’t great, averaging 289,000 viewers, yet it made for compelling theater for those who understand and play the game. Many simply can’t follow along because it moves at such a fast pace and it looks unlike anything that has ever been on a television screen. Football doesn’t have this problem. We learned the rules as children. We huddle around inside living rooms each Sunday. Video game franchises such as EA Sports’ Madden NFL Football and Take-Two Interactive Software’s NBA 2K are already acclimating sports fans to consuming their favorite sports through video game experiences. Starting this month, ESPN will be broadcasting contests from the upcoming Madden NFL 2019 Championship Series, which pits the best Madden players against each other in a competition for $700,000 in prize money. And the NBA has partnered with the creators of the popular NBA 2K franchise to debut the NBA 2K League, which streams its game on Twitch, the leading video game streaming platform. So, if and when enough Americans desert football, a familiar sports esports infrastructure will already exist. Some will say they don’t want to watch video games. This understandable concern is shortsighted and will ultimately be disproved, I think. The underlying issue here is that people don’t want to watch something that looks fake. But soon, the graphics for video games will appear so lifelike that the average person will struggle to distinguish between computer-generated and camera-captured. The creators of Madden NFL 19’s PC version, for instance, landed a product that almost blurs the line between real and fake. A decade from now, video game designers will likely furnish us an experience that mimics reality. Under this scenario, and only under this scenario, fans will get the football they want but can’t get. Fans will be able to watch wide receivers getting jacked up while going over the middle to catch an airmailed pass without having to see a referee hurl the annoying yellow flag. We can see pass rushers try to maul the quarterback rather than, as Cincinnati Bengals coach Marvin Lewis once joked, “cuddle (quarterbacks) to the ground.” We can watch football without worrying about whether we are indulging an inhumane spectacle. This would fix other problems such as bad officiating and overlong replay challenges. We can watch the football we want. 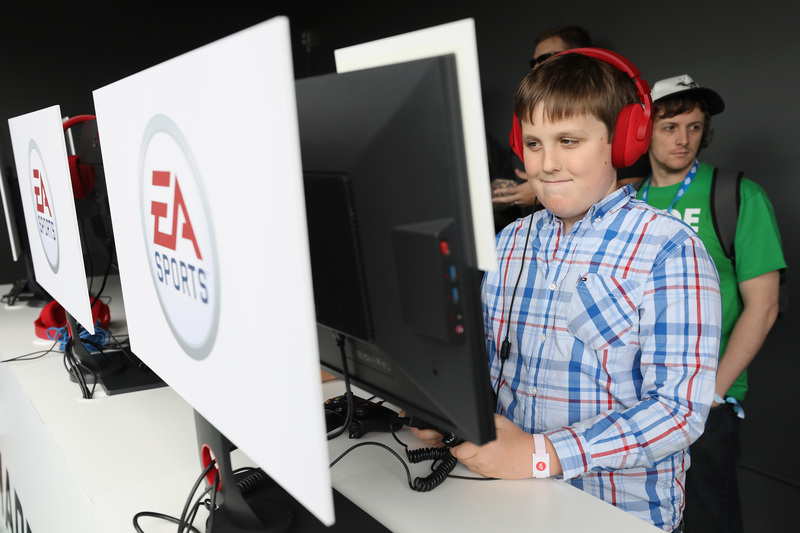 Josh Cherniss of Los Angeles plays EA Sports Madden NFL 18 during the Electronic Arts EA Play event at the Hollywood Palladium on June 10, 2017, in Los Angeles. In Overwatch, players kill each other. No one would watch such a spectacle in real life even if it were legal. Football, decades from now, might be regarded this way in our culture, where people are only willing to watch it if it isn’t real. Another argument will be that the players are necessary. Fans don’t want to watch the sport, so the theory goes, if the players in the uniforms aren’t real people. But this argument hits with a whimper given that central to football’s popularity is the sport itself and the logos on the helmets, not the personas of the players. That the league is so popular while having fewer than a handful of actual stars supports this point. In ESPN’s list of the world’s 100 most famous athletes, the highest-ranking football player is Tom Brady at No. 38, two places behind Derrick Rose. Only four American football players grace the list. Fans often don’t even know what players look like with their helmets off. This might be a good point for, say, the NBA but not for the NFL. And besides, fans will have people to root for — the players behind the joysticks. We can watch football without worrying about whether we are indulging an inhumane spectacle. This would fix other problems such as bad officiating and overlong replay challenges. We can watch the football we want. The dire outlook for the NFL and football will likely worsen as more facts about the violence of the game become evident. And the sport will unlikely be more popular or healthy than it was yesterday. Once society deems a sporting event to be too dangerous, or out of step with the culture, at best it becomes a fringe sport like boxing, or at worst, it could go the way of gladiator bouts. Extinct. Technology is best when it does the work humans won’t do or can’t do safely. We typically think of it replacing low-skilled, low-wage workers. But we should open our minds to it replacing athletes who make multimillion-dollar salaries. Because if technology doesn’t, we might not have football at all.